Ask fellow campers about "Watauga Dam Campground" and nearby attractions. This is a TVA(Tennesse Valley Authority) campground. Rate is $28.00 per night. With America the Beautiful Senior Pass rate is $20.00 per night. All sites are waterfront with water and 30 amp service. The river created by the dam has excellent trout fishing. This is a small campground, but sites are level, spacious, all back-in. Very beautiful setting with mountains all around. Wildlife of all species. One bathhouse with flush toliets, sinks and shower stalls. Campground is clean and well maintained. This was our second visit and will be added to our list of favorites. 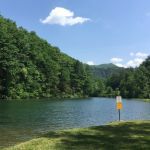 We camped at Watauga Dam Campground in a Travel Trailer. This is one of if not our favorite campgrounds. We are locals and we have stayed there several times. As others have said, all campsites are on the "stream". It’s actually the Watauga River. Very small only 30 sites and we love that. The Camp manager is an outstanding guy and his wife is great as well. The place is spotless, quiet and with great fishing . You better have a trout stamp as the park ranger is fond of righting tickets. You are in bear country so lock up you food. I have already reserved 4 weekend for this summer We camped at Watauga Dam Campground in a Travel Trailer. This is a beautiful TVA campground that is in a valley with tall cliffs and a cold water creek running through that is full of trout. This is one of the coolest campgrounds I have been to, it is just amazing scenery, it is quiet, lot of friendly people. It is run by Recreation Resource Management, so you have to go to their website to make any reservations. The campground is small, so reservations are recommended. Cell service and satellite are good. This is an absolutely fantastic place to stay, I highly recommend it. That said, it is tight quarters, and all back in sites. If you are not good at manuevering your rig through tight quarters, you might want to go somewhere else. 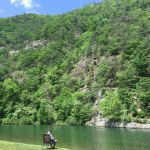 We camped at Watauga Dam Campground in a Fifth Wheel. For an excellent hike to a beautiful waterfall, drive about 5 miles south to Hampton and turn left on Hwy 321. Just as you are leaving town there is a trail head on the right, it is marked with a big Forest Service Sign, the trail is to Laurel Falls. It is just under 3 miles to the falls, which are spectacular. As a bonus, we encountered a large number of Appalachian Trail through hikers, a portion of the trail is on the AT. A TVA campground run by Recreation Resource management so rates were $27 with American the beautiful $7 discount. Located in a steep gorge downstream from Wilbur (? name) dam runoff with gorgeous ~10 story high heavily forested and rocky cliffs on the opposite site of the stream, and cg stretched out at base of smaller more sloped hill. Bathhouse new, beautifully constructed and extremely clean with hot shower. Paved road with wide wooden beam outline sites mostly level with compacted gravel and EW. Dump at cg entrance. Hosts very pleasant and helpful. Well mowed grass about sites and along stream. Fishing in the stream by shoreline and boats. No playgrounds. Tents not allowed due to bear problems. A very pleasant get away campground. We camped at Watauga Dam Campground in a Motorhome. Roads to cg are narrow, windy and poorly marked. our google maps would not mark our blue dot location helpfully. There was a 40 A motorhome and long camper trailers at the campground. As I used 30 amp plug in I just didn't note if had 50 amp. Are you affiliated with Watauga Dam Campground ?